So, the old comfort zone has been getting tested recently. I'm making a very honest effort to rekindle my friendship with Duh'Mill, making myself spend time with "it" at least once a week (so far so good). I am giving myself a much deserved "mini sabbatical" from running to allow my piriformis muscle to calm down (and, hopefully, completely heal). 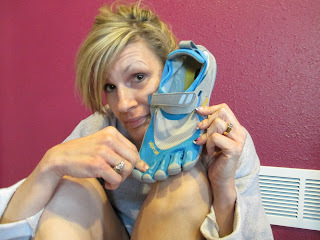 And, today, I added another comfort-zone violation....I purchased Vibrams 5-Finger Trek Sport shoes. I have heard these are great for people with back problems or other issues (not necessarily just running-related problems or injuries). 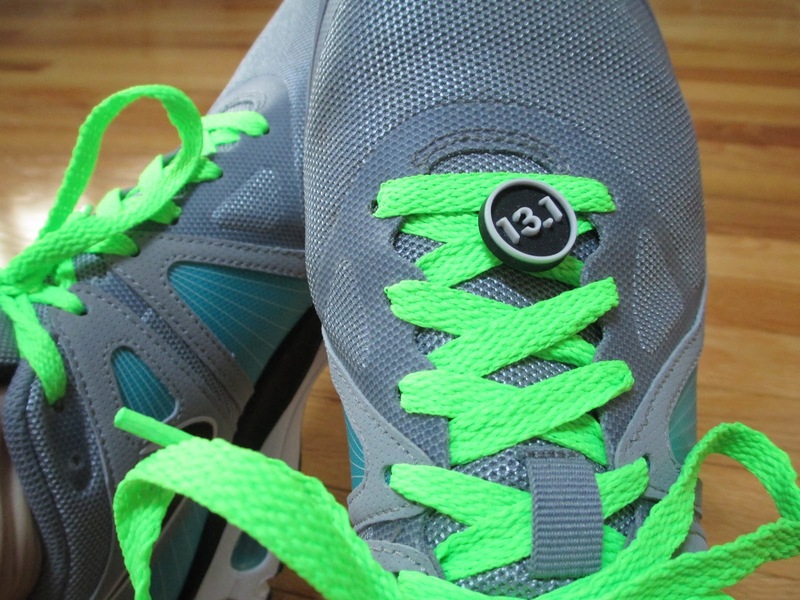 A new trend (for lack of a better word) is the less-is-more movement regarding support in running shoes. I think the theory behind this notion is that most of us are better off running with minimal support. If we try to "correct" our alignment with adding extra support, we sometimes risk "over-correcting" the problem...creating even more problems. This is not my field of study, I'm just repeating some information I have seen. Obviously, we are all created differently. 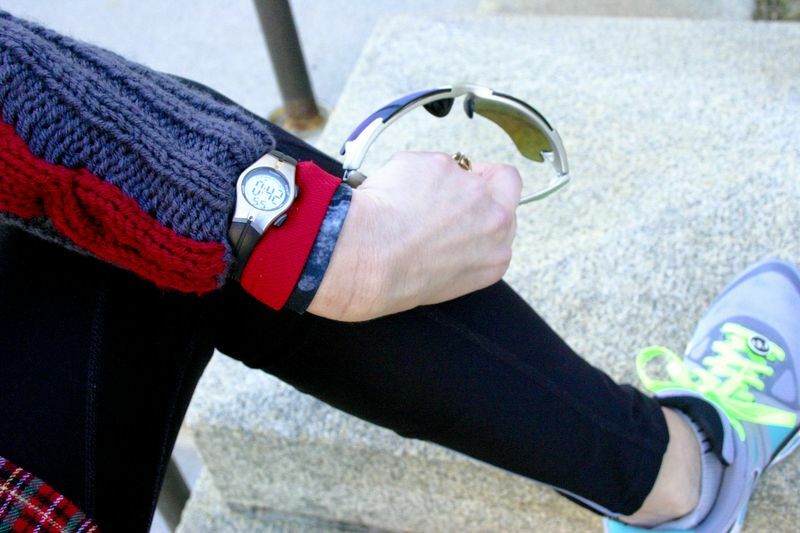 Some are fortunate to have everything perfectly aligned and never have problems running, walking or existing. There are others who do need extra support for various reasons (under-developed bones, misaligned spinal column, injuries sustained from an accident, etc.). 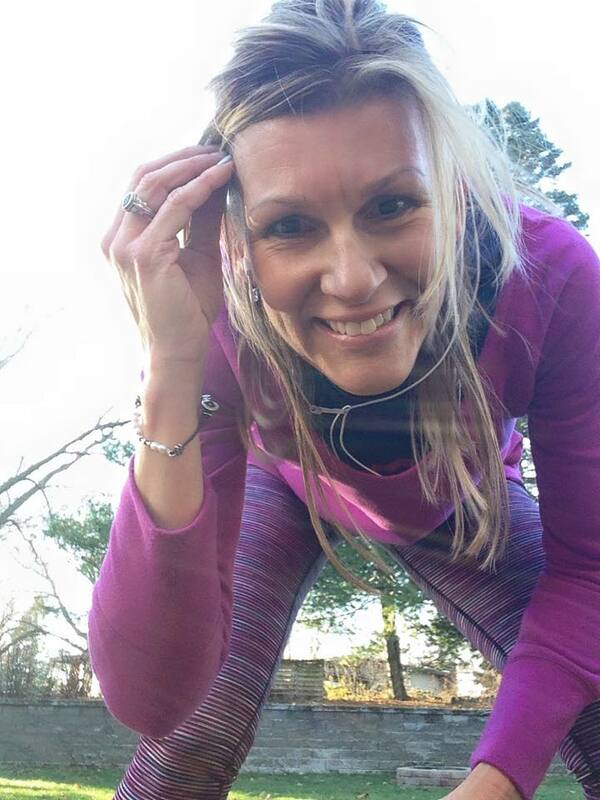 Most of us fall somewhere in between these two extremes, though, and that presents us with the challenge of finding the "perfect" support that will enable us to perform our desired task...for example, running. I have had my feet analyzed at a running store, and have been happy with the shoes recommended for me. Since I am embarking on my first-ever running sabbatical, though, I thought I'd give these Vibrams a whirl (and the fact that a local store had them on sale for a too-good-to-miss price was a great incentive). It was a bit of a challenge putting them on for the first time. I discovered my toes have minds of their own, and all 10 of thems required some assistance finding their respective place in these shoes. The big toe (on each foot) kept wanting to slide into the 1st toe "slot," which propelled the other toes in the wrong direction as well. Once I was able to get the big toe to find its home within the big toe slot, all the others lined up pretty easily...except for the pinky toe (on each foot as well), which did not want to uncurl or cooperate. Eventually all toes were snug in their respective slots. I was told these shoes are to fit snug, like socks, so there should not be any extra room. And I actually like the closer fit of these shoes. 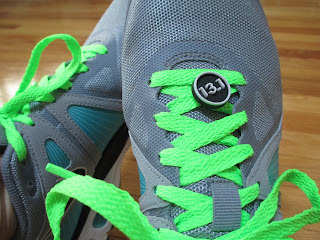 When I buy my regular running shoes, I am usually encouraged to go up a size, to allow for extra toe room. I have mixed feelings on this. My feet are narrow, and adding the extra toe room really gets kind of massive in there. I think my toes move around too much, and feel like they "overlap" on the long runs, creating blisters and some post-race discomfort. To actually have all my toes separated was a different experience, and one that will take some to getting used to. Eager to test out these new shoes, I decided to do some walking on the treadmill. I set the incline on 4, programmed the speed to 4.5 (my usual walking pace). After the first quarter mile or so, I could tell this was going to be another journey to savor. I could feel myself stepping hard on the treadmill belt, so I tried to concentrate on stepping "lightly" instead. I also lowered the speed to 4.0 since this was a different kind of walking than I was used to, it would not be wise to go too fast too soon. And, unlike my usual mid-foot strike, my feet kept wanting to do a heel-to-toe strike. I completed 2 miles. I felt like I maintained a good pace at a challenging incline. I also noticed that my muscle stiffness seemed to feel better after the first mile or so....usually it takes 2-3 miles when I'm running. So, what have I learned thus far? I am not completely in love with these shoes yet, but I do think I will grow to appreciate what they will do for my feet and piriformis discomfort. It's way too soon to determine if these shoes will eliminate all problems for me, or if I will even be a converted 5-Finger Runner, but I plan to use them for walking on the treadmill while on my running sabbatical. 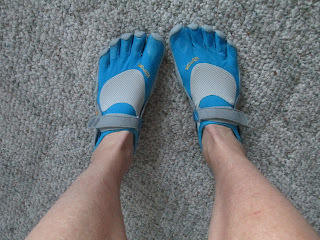 With the form-fitting design, I will need to be disciplined to keep my toe nails trimmed (very short). And, as a long-time owner of long, narrow feet....I have a small taste of what it feels like to look down and see a wide-expanse of shoe (completely NOT sold on that feature!). Stepping out of the comfort zone...always worth the effort. Even if it means staying inside, with Duh'Mill. 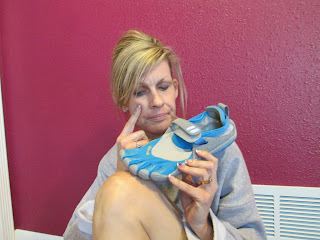 Have any of you used this kind of shoes for running, or have converted to using them exclusively? 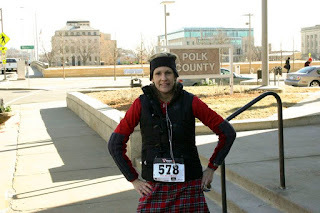 Even though I'm not your "run":of the mill race winner, I have a tendency to get frustrated with "event participants" (I hesitate to call them racers) who show up at races and act like they don't take running seriously. You've probably seen them.....all decked out in crazy costumes that are impossible to "run" in. Granted, they are probably doing the race to have fun with their friends, but I struggle to understand the significance (or sense?) of spending money on a race that they aren't even trying to "run." Let me remind you, I live in Iowa. Most of the racing I do is in the extreme Iowa climate. 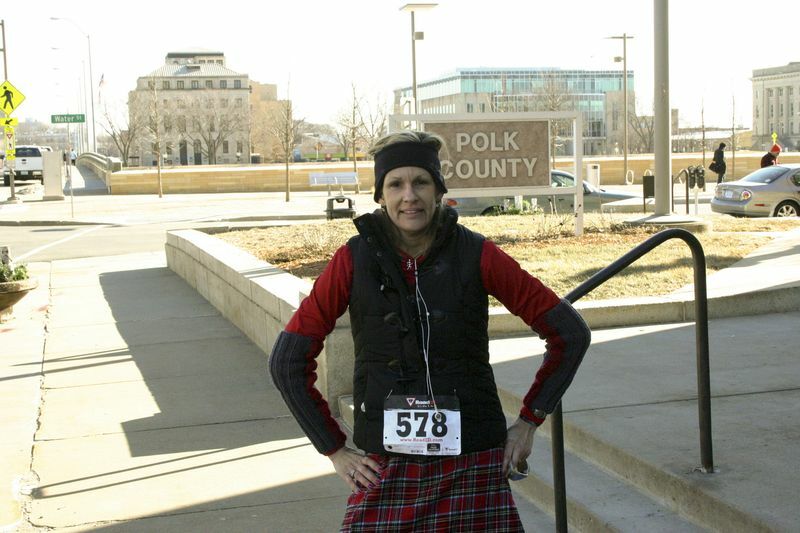 The first year (2011) I ran this race, the weather was pleasant for February. There was sunshine and the temps were in the mid-30's, I believe (I have vague memories of splashing through a few puddles along the course). Last year (2012), it really felt like a winter day in Iowa. Cloudy, windy, near zero-degree temps. Not pretty. This year (February 16, 2013), it was around 18 degrees and sunny. There was a little wind, but just having sunshine minimized the wind chill. 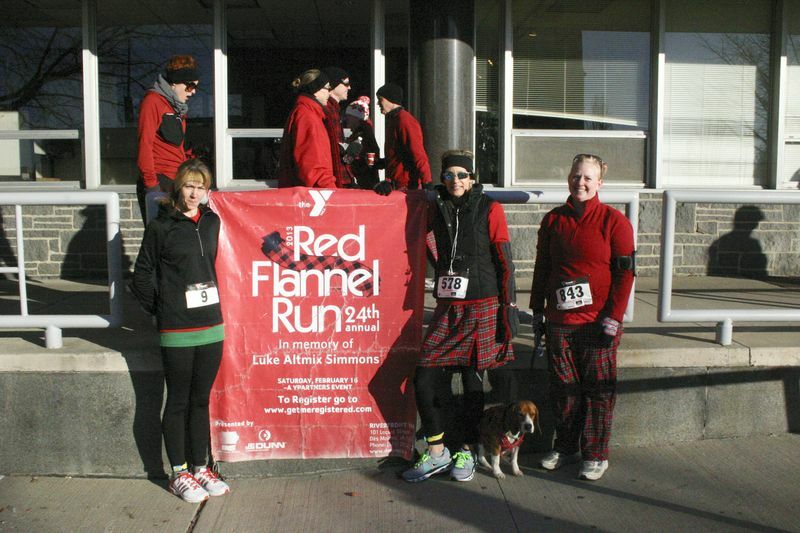 The Red Flannel Run takes place in downtown Des Moines, our state's capital city. And, similar to a lot other state capital buildings, ours is located on a significant hill. This year, the race route had changed and included a lap around the capital grounds. At the beginning of the course, within the very first mile. O.U.C.H. Personally, I do not love hills. I know they are a necessary evil for runners, so I run on them occasionally. Despite the effort, I absolutely love that very moment when you reach the crest of a hill, you can actually feel the terrain ease up underneath your feet. Even if I don't love the hill, I still love that sweet feeling of accomplishment. So, as I was trudging up this hill, that evil little voice in my brain was trying to talk me into walking. "It's just the first mile, you'll have 4 more miles to make up the time you'll lose by walking." No, no, no, NO! (Fortunately, I have another voice in my brain that also talks to me) "YOU are going to conquer this %$*&^ hill, and maybe even gain some adrenaline out of the effort. YOU know can run and finish this hill." So I did. The next best thing to defeating a steep hill climb in your running shoes, is the downhill that immediately follows. During the climb, I was working so hard to keep my stride that I could feel my body over-heating. I momentarily questioned my choice in clothing, regretting that I'd worn a tried-and-true puffer vest instead of a jacket (that I could have shed and tied around my waist). Upon cresting and then running downhill, I was reminded that I have run outside in cold weather numerous times. I was reminded, again, that it was February in Iowa...and still a mere 18 degrees outside. The puffer vest was a perfect choice after all. The 2nd mile was a cold one. Even though there was ample sunshine, we were running on the city streets, so we were in the shadows of all the buildings. Despite the lack of sunshine on my face for most of the race, the air was much warmer than if it had been hidden behind clouds. The 3rd mile was much better. 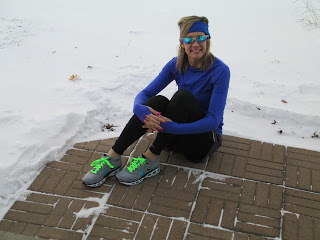 My body had reached that point where it was warmed up sufficiently, my stiff IT Band/Sciatic Nerve issue had loosened up and I could feel my pace starting to come alive. M ile 4 felt great, as well. This part of the course had an out and back leg. As I was just turning onto this leg, the lead runner went striding past me in a blur He was only about 1.8 miles ahead of me. Good for him. He was in a tank top and shorts (did I mention it was 18 degrees and February? 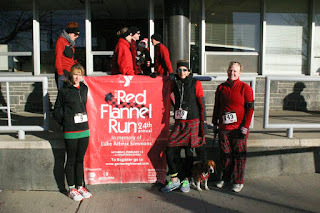 ), maybe he had a red flannel blanket waiting for him at the finish line. 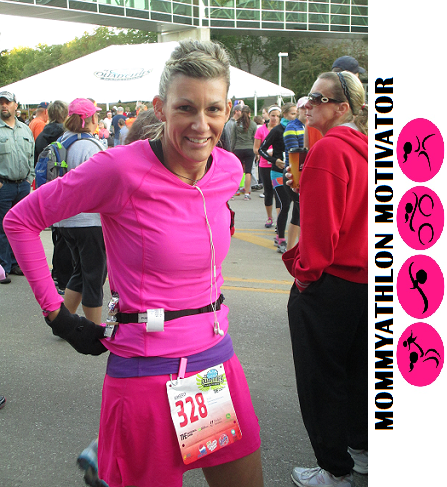 As I reached the turn-around, just into mile 5, I could feel that much-awaited-for adrenaline taking over. I could see the finish line in the distance and knew I would soon be there. I checked my watch and saw that I'd managed to keep a decent pace, despite that treacherous hill and my stiff muscle issue. I was able to "bring it" and finish with a time of 42:55 (according to my watch). I later learned my official finish time was 42:42...even better. 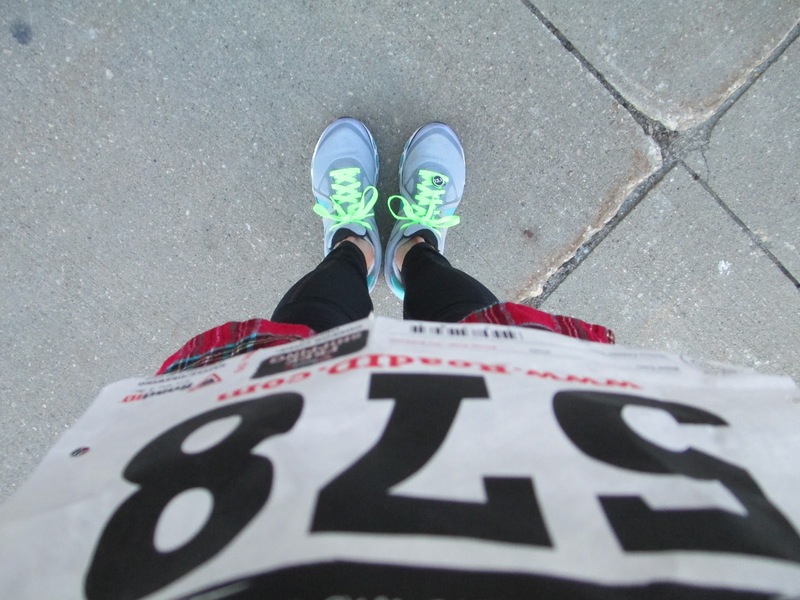 Every race (and most runs) come with lessons learned. Bottom line, I am always reminded to trust myself. I am not new at this. I know how to dress for the weather. I have conquered many hills. If I have a stiff muscle, it will always loosen up as long as I keep moving. And, it's fun to run in costume once in awhile. I think I am becoming a race snob, and I don't think I like this. Not one little bit. So, how did my snobbery begin, or where? It's difficult to pinpoint an exact moment in time. And there are almost 8 years of running to retrace for me to solve this mystery. I have already publicly confessed to being a t-shirt snob. This is an easy one to figure out. I do not like loose or baggy clothing. I don't strut around in skin-tight apparel, but I prefer my clothing to be fitted and tailored. Most race shirts tend to be unisex sizing, which also means a unisex cut, so they are not flattering on a woman's body. Also, a lot of race shirts are cotton, which is not ideal for working out. So, I tend to reject race shirts if they're not a tech material. Call me a snob (I have already done so). The racing snobbery is a little more complex to figure out. I have been running for almost 8 years, and over the course of those 8 years, my pace has increased. I used to be euphoric if I ran a 5K (3.1 miles) with a 10-minute pace. As I became more disciplined, and started running more frequently and for longer distances, I have watched my pace increase and my finish times decrease. This is a good thing, right? How can I see any bad in that? Well, I am not a sprinter. I can attempt to run fast, but I don't have the genetics to really outrun the ones who have the natural ability to do so. Really, I am okay with that. Although my pace is now around an 8:30 mile, the real fast runners are running sub-6-minute miles. And, I will probably never catch them. What I have discovered, though, is that I have the endurance genetics. I can run long distances and still feel great when the race was over. It seems most of us are either one or the other...speedsters or endurance junkies. There are some exceptions to this, and these would be the marathoners who can run 26.2 miles in 2 hours (or maybe less). Some runners have the gift of possessing both of these qualities, but they are rare. I have run a lot of 5K's in my lifetime. And, I have not won any of them. In recent years, though, I have placed in my age group on some occasions, achieving the coveted 1st, 2nd or 3rd place finish (and the hardware that comes with it). Most of these have been small races (and usually on cold days, when fewer people turn out), but I have have had the experience of finishing in front of the herd. Yay for me. So, when I got bitten by the "distance bug," and started doing longer races, I really felt like I had found my calling. 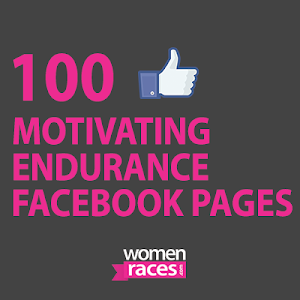 These races required some speed, but endurance was what would get you to the finish line. Also, more importantly to me, these races required a lot more discipline and time in training. After investing a few months of "boot camp-like" training, the reward of completing a distance race was extremely fulfilling. So, here I am. Starting to snub 5K races. Maybe it's because the 5K distance is no longer a challenge for me, unless it's a course with some good hills. I know there is always the challenge of having a PR (a Personal Record, a faster finish time), but when you're not a fast runner to begin with, the idea of attempting a 3.1 mile sprint is not very enticing. Also, I have been battling some IT-Band issues in my left hip area, for the past 18 months or so. Basically, I have some stiffness (and don't have full range of motion), and it takes a good 3-4 miles to get things loosened up...so, if I'm trying to "race" for 3.1 miles, a lot of the time I'm not really "racing" until the last half mile or so. That presents me with a disadvantage...and it's frustrating to do a race knowing I'm not really able to give it my all for the duration. I should mention that a lot of 5K races are fundraisers for charities. Although many of these such races come with the dreaded souvenir t-shirt, I have learned to "forget" the shirt at the registration table (or take it and donate it to someone who has a greater need for it). 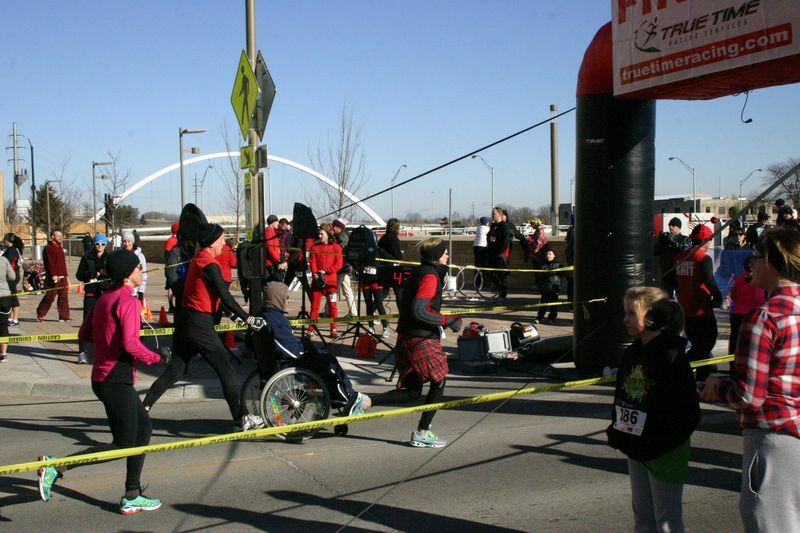 Although I am not crazy about the 5Kdistance, I do participate in these events periodically. Fortunately, some races are now starting to offer a 10K option, which is great fit for the runners who want to go a longer distance.